Rachel Hastings is the President's Scholar for MGA's Class of 2017. Each year, a graduating senior is chosen by the Honors, Awards and Graduation Committee, with the approval of the University president, to be the President's Scholar. The chosen student must have an outstanding academic record, involvement in campus and/or community service activities, and demonstrate characteristics indicating the promise of a successful future. Hometown: Cape Town, South Africa. "I spent the first 19 years of my life in South Africa. My mother is American, but when she met and married my South African father, our family ended up living in South Africa. Because my mother is American, I have dual citizenship and would visit family in America every couple of years. In 2013, my parents, sister and I moved across the ocean and settled in Middle Georgia. We followed my three older brothers who had moved to America to settle down." High School: "I homeschooled for grades 1 - 12 and participated in extracurricular activities with a local high school and various art institutes. I loved taking part in photography, theatre, cricket, and field hockey." Family: "My parents, John and Becky Hastings, have been married for 36 years. I have four siblings, two sister-in-laws, two nieces and four nephews. My sister, Leah, is a dual-enrolled student at MGA. My brother Nathanael is married to Karis, with Abel, Isaac, and Lydia; brother Matthew married to Rachel, with Hope, Ian, Asher; and Michael." Employment: "I am a full-time student and work three jobs. I am a student worker for the Media, Culture, and the Arts Department. I work in the MacLab helping students understand Mac computers and Adobe software. I work as an intern at NewTown Macon as part of a work study program. Finally, I work remotely for Camp Sonshine, Md. I spend my summers working at the camp in Maryland. This year I have been doing admin work for them throughout the year." Activities: "I am the president of the Honors Student Association. The Honors Program provides opportunities for students to present at undergraduate conferences, take part in service projects, and attend events that are a mixture of fun and information. This semester, I organized our Honors Program service project in partnership with the Methodist Children’s Home. We had a bake sale at their Celebration Day event in April, and all proceeds went to the children in the home. (Thank you, Dr. Clay Morton, for the opportunity of being involved in the Honors Program)." Career Goals: "I would like to be a film studies professor. I love the academic environment and I was inspired to become a professor because of some of the incredible professors I have had at MGA, in particular, Dr. Michele Beverly, Jesse Klein, and James Sisson. I want to use film to educate and inspire the next generation. Film is a universal language that can facilitate conversations about deeper social issues." She chose Middle Georgia State University because … "It was (and is!) affordable and amazing. When I first arrived in Middle Georgia, I toured Mercer, Wesleyan, and MGA. In my opinion, MGA offers everything provided by the other schools at a fraction of the cost. MGA has incredible faculty, staff, and campus amenities that allow students to learn while enjoying their university experience." The greatest thing she discovered about Middle Georgia State was … "The Recreation and Wellness Center on the Macon Campus! The Wellness Center was completed shortly after I arrived at MGA and it is a wonderful facility. I enjoyed being able to release pent up stress from schoolwork through a good workout. I even had the pleasure of taking part in a volleyball tournament. Another hidden campus gem is Miss Mary’s chilli in the library! It’s delicious and it’s less than $3!" Her greatest academic experience as a Middle Georgia State student was ... "My Comparative Culture class with Dr. Michele Beverly. We looked at African American culture and Jewish culture. The class explored the two cultures side by side and considered possible similarities and differences. The intent was not about equating the cultures or putting one above the other. The class analyzed depictions of each culture in books and movies. The most impactful moment for me was learning about the emotional experience of diaspora and how forcibly removing a cultural group from their homeland can negatively impact individuals and their descendants." To her, “greatness” means … "Having the courage to try. I believe that every individual has different strengths and weaknesses. Sometimes fear will get in the way of someone discovering a strength. Nelson Mandela said, 'Courage is not the absence of fear but the triumph over it.' Without the courage to try, someone could miss out on the discovery of a new strength. Trying does not mean the fear goes away but it builds courage and increases a person’s unique greatness." One thing people don’t know about her is … "I love receiving letters and I have kept every letter that I have been given since I was 10 years old. I have a box full of them and I will go through and reread them from time to time." In five years ... "I hope to get both my master’s degree and my Ph.D, so I see myself in school for many years to come!" 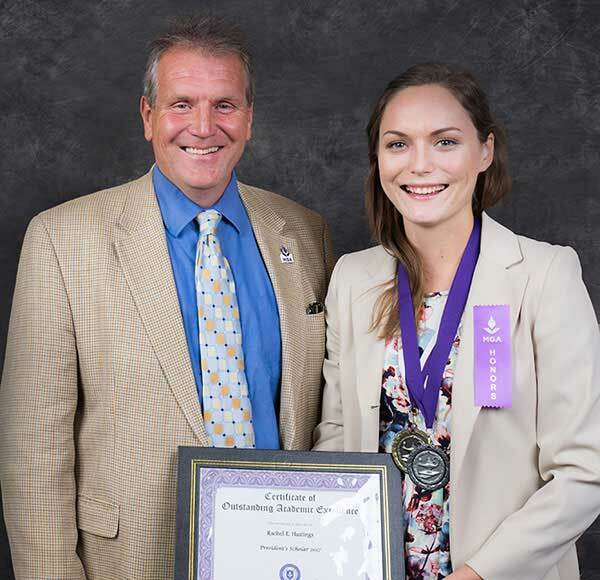 Photo: Rachel Hastings with Dr. Christopher Blake, MGA president.